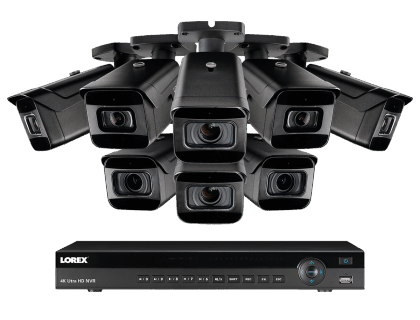 Learn more about the Lorex 4K Ultra HD IP NVR System with 8-Outdoor 4K 8MP IP Cameras. Find pricing, and answers to common questions. The Lorex 4K Ultra HD IP NVR System with 8-Outdoor 4K 8MP IP Cameras comes with eight nocturnal security cameras and a 16-channel network video recorder (NVR). This Lorex business security system is audio enabled and performs in extreme weather. 350 ft. maximum night vision range. Pros: Cameras' field of view is adjustable to suit users' monitoring needs. Cons: Not that affordable for very small businesses. Bottomline: Versatile solution for monitoring a wide range of businesses in all weather. What are some alternatives to the Lorex 4K Ultra HD IP NVR System with 8-Outdoor 4K 8MP IP Cameras? Where can I buy the Lorex 4K Ultra HD IP NVR System with 8-Outdoor 4K 8MP IP Cameras? The Lorex 4K Ultra HD IP NVR System with 8-Outdoor 4K 8MP IP Cameras is available via Amazon and the Lorex website. Does the Lorex 4K Ultra HD IP NVR System with 8-Outdoor 4K 8MP IP Cameras work at night? Yes. This security system's cameras included in this security camera system come with high-powered infrared LEDs that enable a night vision range of up to 350 ft. Its color night vision (CNV) capabilities enable it to see colors in the color in the presence of ambient lighting, and its employs digital noise reduction technology to filter out digital noise from low-light scenes. Can the Lorex 4K Ultra HD IP NVR System with 8-Outdoor 4K 8MP IP Cameras be used in any weather? Yes. The Lorex 4K Ultra HD IP NVR System with 8-Outdoor 4K 8MP is weatherproof. Its IP67-rated cameras are resistant to inclement weather due to their high-grade aluminum housing. This security system can operate in temperatures from -22 °F to 140 °F.